Smadar picked this beautiful bouquet from her garden and orchard - an arrangement of seasonal fragrant flowers from trees, bushes and shrubs which were the inspiration for the evening titled Besamim me'ha'Bustan (Perfumes from the Orchard) and which took place on March 19th at the restaurant Smadar be'Clil in my home village in Israel's scenic Western Galilee. It was both a pleasure and honour to co-host a night of perfume, desert and wine pairing with Smadar Yardeni of Smadar be'Clil and Yaniv from Lotem Winery. And the response form the guests and audience at the event has so much exceeded my hopes and expectations I am still feeling warm and fuzzy inside reminiscing about that beautiful night. The reason it took me so long to post about how it went can be attributed to traveller's wi-fi woes, as well as prolonged case of jet lag. But neither has diminished my memory from a most fine night spent with very lovely people, both on the hosting and the guest side. 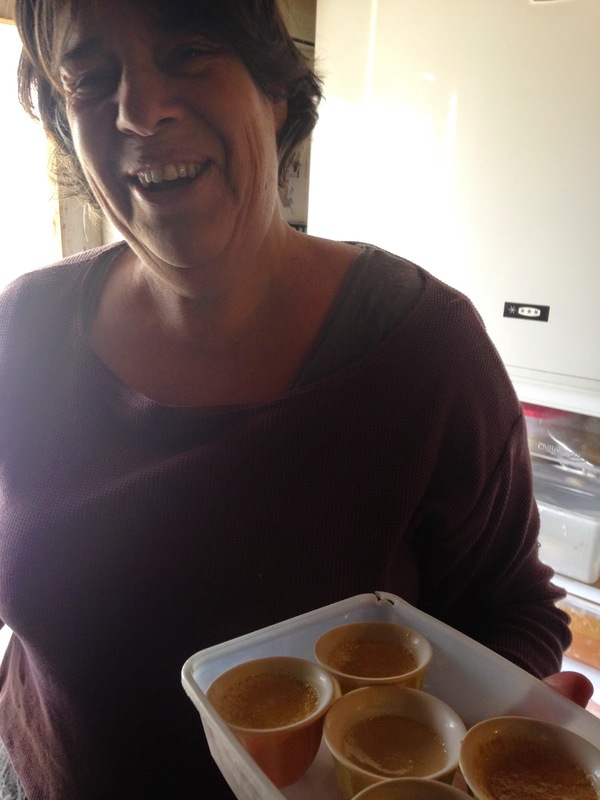 Here's Smadar on the morning of the event, with the lavender & Earl Grey creme brûlée she's prepared in taste-size portions inside Turkish coffee cups. These were creamy and delicious, the caramelization process she did in the process of cooking the custard gives these brûlée a hint of honey. Once I set the table with my mini-display (nothing too fancy, as it was all carried in my suitcase along everything else I needed for three weeks abroad) - it was time to taste the beautiful wines Yaniv brought with him from Lotem Winery. We selected three wines from Lotem for the pairing, plus one white wine from Kishor Winery: a lovely, citrusy-floral Savant Viognier, to go with the vegan malabi (based on coconut cream and flavoured with orange flower water). Note to self: an evening that starts with a glass of organic wine can only be a happy one. The event was structured as an olfactory and culinary symphony with 6 acts around 5 desserts that was inspired by seasonal ingredients, and was complemented by 6 perfumes, 4 wines and 2 teas. In each "section" the guests experienced raw materials in their essential oil (or absolute) form, then smell them within a perfume, taste them in a dessert, and enjoy a complementary beverage (either tea or wine, or both). We opened the evening with rose-tinged marzipans, handmade by Smadar, paired with fresh Charisma tea (loose leaf jasmine plus fresh herbs from Smadar's garden) and Vivace - Lotem's fine rose wine, which is extremely light and unusually on the dry side. I then spoke about two familiar yet fascinating ingredients: mint and almond, and let the guests smell essential oils of both, and also perfumes that are related to the subject: Charisma (which includes spearmint) and Hanami (inspired by cherry blossoms - which are not unlike the almond blossoms that were in bloom still last month). Next came the fantastic creme brûlée I told you about earlier. Everything was beautifully served among sprigs of blooming lavender, and the individual Turkish coffee cups were a perfect size to serve such a decadent treat. I then let the guests smell essential oils of both lavender and bergamot and spoke about the connections these have via chemistry and their presence in the ever so popular Earl Grey tea. We smelled Lovender perfume at the end of this section. The third part was spicy and warm, with vegan ginger mini muffins, studded with crystallized ginger inside, and served alongside dainty little teacups of piping hot soy milk chai. We smelled spice oils, with primary focus on ginger and cardamom (which are botanical relatives) and spoke about spices that are "warm" versus spices that are "cool". We also smelled Zangvil perfume, of course. Now we took a little intermission from the desserts, and experienced Sonore - Lotem's bold Shiraz wine, accompanied our "tasting" of anything rosy: we experienced rose otto and absolute, as well as Cabaret perfume - a demonstration of rose and musk. Yaniv explained about the origin of this grape, from Shiraz in Persia, which tied in beautifully to the origins of rose (Rosa centifolia or May Rose is native to Persia as well). I also tied it with the fondness of Muslims to musk and roses, and the symbolism of roses in Sufi poetry. The highlight of the evening was one of the most beloved ingredients of all: orange blossom. We first experienced it in the vegan malabi (based in coconut cream) alongside the beautiful Savant Voigner from Kishor - which highlighted the citrusy notes, and even the petitgrain-like character of the orange flower water (something that my brother Yotam, who was among the guests in the event, pointed out). We smelled different types of orange blossoms - orange flower water, orange flower absolute and neroli. The grand finale was the chocolate mousse that was flavoured with orange blossom absolute and wild orange oil, topped with candied kumquat slices (from Smadar's orchard, of course). We paired this with the stunning Nebiolo, an aromatic yet light Italian varietal with floral characteristics and definite cassis flavours. And we concluded with smelling Zohar perfume - which went beautifully with all this luscious gorgeousness and the good mood that was already in the room went up even a few more notches. I truly hope to create more events in the future with Smadar - it feels like this is just the beginning of a great friendship! Last but not least, because this is the first day of April, it's time to announce this monthly giveaway: Leave a comment on this post, with your guess as to which flowers were in Smadar's beautiful bouquet - and enter to win a mini of Cabaret! All those blooms look beautiful, where I am (Kiev) spring has barely started. From what I can tell, there's rose, acacia (mimosa), lavender, orange blossom and some herbs or grasses that I couldnt identify.